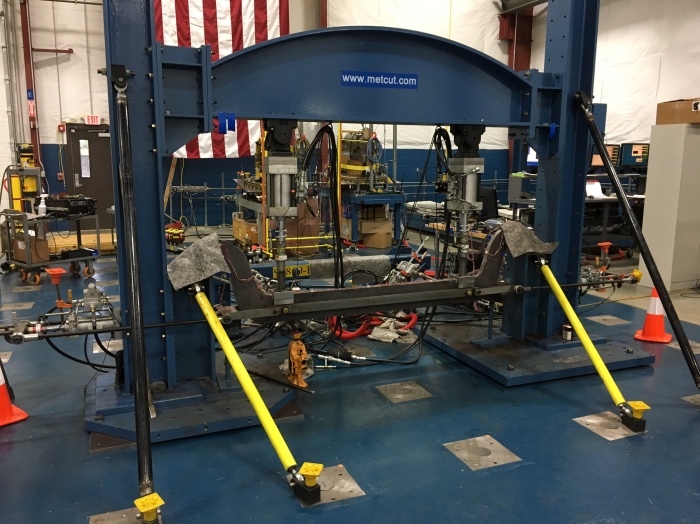 Component Structural Testing is conducted in single axis (200kip), torsion (1.0×10^6 in-lbs. ), axial torsion and multiple axis configurations for the aerospace, land transportation and oil & gas industries to meet the requirements of various national standards. The 1800 square foot, 600 ton strong floor is the primary reaction mass. The laboratory is equipped with the latest MTS AeroPro servo-hydraulic control systems, with the capability of up to 15-axis control to meet demanding requirements. A variety of ancillary sensor equipment is available to optimize the testing of your component to meet specific needs. Additionally, the digital acquisition of strain, load, temperature, displacement and pressure can be measured on up to 200 channels simultaneously.